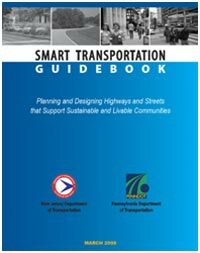 The Smart Transportation Guidebook, released in March 2008, was developed in partnership with the Pennsylvania Department of Transportation (PennDOT). The Guidebook provides the state Department of Transportations, local governments, developers and other interested parties with a context sensitive approach to roadway planning and design. The Guidebook is to be applied to non-limited access roads and focuses on the development of cost-effective, context sensitive roadways that support community planning goals. A toolbox of Smart Transportation techniques is provided along with a detailed approach to identifying, defining and matching different land use and transportation frameworks. This unique guidebook details design guidelines for both roadway and roadside elements and a template of flexible design values for various road and community environments. which defines and provides examples of smart transportation solutions. The design of a road should reflect the surrounding environment and the role it serves in the community by using transitions through rural, suburban and urban communities and reflect the unique conditions along the way. The approach to identifying transportation needs and potential solutions should be developed in partnership with the community, project team members and other interested parties early in the process. It is necessary for NJDOT and the community to work together to ensure that appropriate land use controls are put in place and the roadway design supports community goals. Similar to the Complete Streets concept, Smart Transportation encourages roads to be designed with all users in mind, balancing vehicular and non-vehicular needs. The use of a flexible design approach is essential to providing a context sensitive roadway that meets the unique circumstances of a given community. This approach requires the designers to think outside of the box and use their professional judgment to develop a creative solution. Considering possible transportation solutions should first include lower-cost, lower scale approaches such as transportation system management and other non-capacity adding solutions before seeking a widening alternative.